At Startup Weekend Biel/Bienne, you'll be working intensively on your Value Proposition. Hereafter, you'll find an introduction about this tool, which will help you define a structure for every kind of project you can be launching. what are the benefits of my idea/product/service for my future customers? To answer these questions, how about using a tool like the Value Proposition Canvas to clarify and structure the idea? The Value Proposition Canvas helps you clearly define your idea and put your potential customer in the center of your project. It’s way too easy to imagine what customers think and never actually go speaking to any to validate your assumptions. What is the value proposition you intend to deliver and do you really respond to their needs or problems with your products? 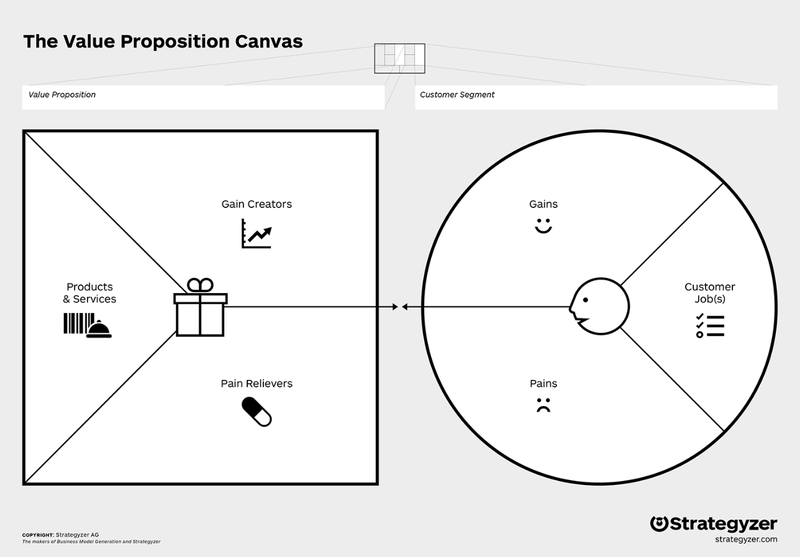 The Value Proposition Canvas will give you the framework to list your assumptions, test your market and finally, validate (or invalidate) them. Get the coffee machine ready ;-)! Always start by the right the customer side! Select one of the customer segments you want to target to create a detailed profile. Be precise in your segmentation to have a clear and usable understanding of your customers’ profile. Start by analyzing the customer Jobs: what are they currently doing in their job or in their life to reach a certain goal? What are the process and the tasks they do? Example: they need to open three different softwares before performing a reporting task. Identify the customer pains: list all the risks or obstacles related to their jobs or activities you’ve described in the customer jobs section. Everything hurting people and resulting in sub-optimal outcomes. Finally, identify customer gains, that are the more or less expected benefits they are seeking. Once you have brainstormed it and listed all of this, prioritize all the customer jobs, pains, and gains, from the most to the less important. Half of the Value Proposition description job is done now, but it is not over. Remember not to include any of your product idea to the profile! In addition, try to analyze your customer with the highest objectivity and hindsight. Before going to the left side of the canvas, you should get out of the office, talking to your target customers. Why? Simply because the job you’ve performed now is basically listing assumptions (except if you’re doing this Customer Profile directly with some of your targeted customers). In order to be able to move forward, you have to validate (invalidate) these assumptions. Talking (and even better, listening!) to your customers will provide you with this kind of information. And probably also discover hidden insights, that you’ll be able to leverage afterward. It’s an iteration process: do not be afraid of refining your model! You can now start to fill the other side of the canvas: the value map (also called product offering). Do not forget that the Value Proposition Canvas is made of two separate building blocks, that you should not mix. It’s creativity time! Now you can let your idea shine, but respect the structure of the model: lists all the features of your product or service to build your value proposition. Identify the pain relievers: what will help your customer to eliminate risks, bad outcomes or any obstacles in their job or life. Do the same for the gain creators by explaining how you will create such desired outcomes. Finally, rank them by importance (higher to lower). When you compare both sides of the model, your gain creators and pain relievers should respond to pains and gains of your customers (described on the customer profile). There needs to be a fit, otherwise, you’ll be building something that nobody wants (which is the #1 reason why new products or startups fail)! Don’t be too ambitious by trying to respond to everything in the first version of your product. Focus on the essential. Having a clear overview of your Value Proposition, you are now able to move ahead and start building your product. It does not mean that your product will be perfect or that the customer insights you’ve collected will make you successful. Maybe the customers you’ve interviewed are not representative of the whole market. But at least you’ve made a huge progress in your journey to reach the “product-market fit”.